Indonesia's Sinabung volcano in northern Sumatra province erupted on Monday (Dec 18) spewing hot clouds of ash, the Xinhua news agency reported, citing an official monitoring the volcano. 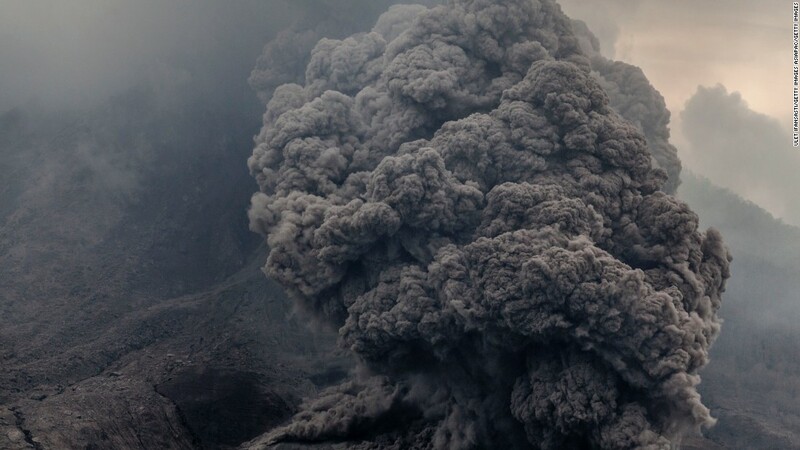 The eruption took place at a 1.02pm local time and was accompanied by about 5 minutes of tremors around the area, the head of the Sinabung volcano monitoring post, Armen Putra, said. "Hot clouds were seen rising 2,500m to the east-southeast and 3,500m to the south," he said, adding that the volcano summit was engulfed by a thick haze. Wind later blew the volcano's ashes in the west-south direction, he added. The public has been advised to stay away from areas that have been declared as red zones around the volcano as more eruptions were expected to take place, he said. The public should also remain alert for the possibility of a flood of cold lava coming from the volcano due to the recent rainy weather. The Indonesian authorities have imposed the highest alert on the volcano, which has been in place since 2013 when it began erupting. The volcano previously erupted on Nov 29, when it blasted a column of volcanic ash and hot clouds. Over 2,000 people have been displaced as a result of the ongoing volcanic activity. Video of an eruption 2 weeks ago.